Through (only) four visits to India, we have come to the conclusion that, unless you discover that you dislike India intensely and will never return, you are obliged to learn acceptance. We don't mean a negative, pessimistic or cynical kind of disengaged acceptance, rather the realization that the world is far more varied than what you see in the clean urban environments, not to mention the sanitized malls, to which we westerners have become accustomed. Rather, as Siddartha, the soon-to-be Buddha, also learned, the world includes sickness, age and death – as well as ignorance – and, we are obliged to add, poverty. But it also includes a kind of happiness and interior peace, as well as compassion for our fellows, that we don't dream of any more, the lack of which is certainly what Aleksandr Solzhenitsyn was referring to when he spoke of the West as being in "a harsh spiritual crisis and a political impasse." Although India also is deeply into political problems, there remains a joie de vivre that greatly impresses anyone who takes the time and trouble to see it. This is not to say that their lives cannot be improved materially. As we already pointed out, we were greatly impressed by the solidarity shown by Indians in situations where this was possible, for instance, within the two centers for leprosy victims. We want to be quite clear about this: The current western model of society which imposes a false sentiment of individuality on its members and thereby increases the competition among them is incompatible with this form of helping each other. We have much to learn from the Indians and that in turn requires a humility that most of us westerners seem to have lost in our self-satisfied lives, often devoid of compassion and love of the Other. Also, India is not the west and Indian problems require different solutions from western ones. This is due to their culture being so different from ours. Tulsi tells a story of how a Dutch group installed toilets and drain pipes in a village where the population had the habit of relieving themselves in the fields. Returning a year later, the Dutch discovered that the toilets were being used to store grain and the pipes, for irrigation. The villagers had returned to the fields, turning the stuff under the soil with a stick so as to use it for fertilizer as they had been doing for centuries. The point is that the villagers needed pipes and storage containers much more than flush toilets. We who would have the temerity to suppose we can help them must take into account their perception of their needs and their particularity or uniqueness. Consideration of their uniqueness in turn requires acceptance of their differences, of the fact that there is more than one way to live, both technically and spiritually, and that we westerners can not impose our culture on them. This is a mistake that colonial powers have been making (on purpose) for centuries and it must stop. As Tulsi pointed out to us, India needs financial aid from the west, but it must not be in the form of huge farms owned by agri-conglomerates which force individual farmers off their lands and into huge slums on the outskirts of the big cities. DISCC – Dr Tulsi and his staff, aided by their western supporters – attempts to work inside India with an entirely Indian staff and with Indian cultural ideas and values to improve the lives of poor and handicapped children, of victims of leprosy and of young women in a small village. 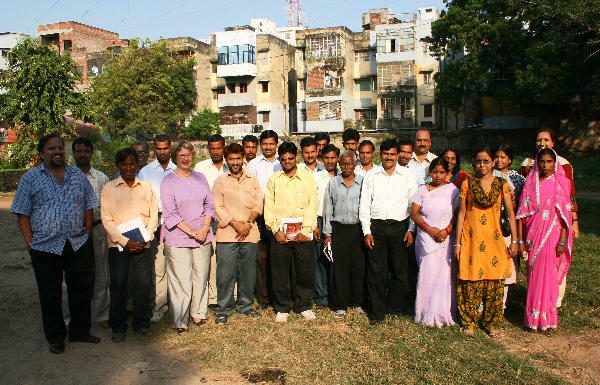 Working through and visiting organizations like DISCC can help us non-Indians to appreciate – in all the senses of the word: to be grateful for and to value highly, to be conscious of and to increase in value – the lives of Indians at the same time as we expand our own intellectual, cultural and moral values. Back to home page/accueil or to Nepal-India tour.